On September 27th, 2018 I gave a presentation titled “Writing Standard Library Compliant Data Structures and Algorithms” at CppCon 2018. I’m happy to say that one of my session proposals for CppCon 2018 has been accepted. The presentation I will give is titled “Writing Standard Library Compliant Data Structures and Algorithms”. 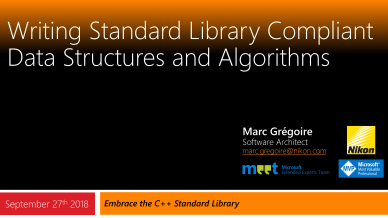 The C++ Standard Library provides a lot of data structures, such as sequential containers (vector, array, deque, list, and forward_list), ordered associative containers (set, map, multiset, and multimap), unordered associative containers (unordered_set, …), and container adaptors (stack, queue, and priority_queue). It also provides a wealth of algorithms for sorting, searching, computing, and so on. Even so, it cannot provide every possible data structure or algorithm that you might need. So, sometimes, you might find the need to write your own data structure or algorithm. Since you are writing them yourself, you could give them any interface that suits you. However, wouldn’t it be better to make them compliant with the Standard Library? That way, when you write your own algorithm, you will be able to use that algorithm independently of the type of the container that contains the data for your algorithm. Similarly, if you write a Standard Library compliant data structure, then you will be able to use Standard Library algorithms on the data in your own data structure. It’s clear, there are a lot of advantages in making your data structures and algorithms compliant with the Standard Library. We’ll first develop a simple algorithm with our own interface. Then we’ll look into what changes we have to make to transform the interface to be Standard Library compliant. Finally, we’ll demonstrate our adapted algorithm by running it on data in a variety of Standard Library containers. In the last part of the presentation we’ll crank it up a notch. We’ll start by writing our own data structure, initially without thinking too much about the Standard Library. Then we’ll look at an overview of the different sets of requirements that the Standard Library imposes for the different types of containers (sequential, associative, and unordered associative). Finally, we’ll adapt our data structure step-by-step to transform it into a Standard Library compliant data structure. This of course includes writing a suitable iterator. Finally, we’ll demonstrate the transformed data structure by running Standard Library algorithms on the data in it. If you want to write truly generic and flexible data structures and algorithms, then this session is for you. More information about CppCon (#CppCon) can be found here: https://cppcon.org/. CppCon 2016 was again a great success. I’m looking forward to next year’s edition. In the meantime, all sessions are now available on the CppCon YouTube video channel. The CppCon 2015 program is almost complete. The program contains over 100 one-hour sessions by over 80 speakers. This year, the opening keynote will be given by C++ creator Bjarne Stroustrup on Writing Good C++14. I’ll be giving a presentation myself titled “Cross-Platform Mobile App Development with Visual C++ 2015” on Tuesday, September 22 (3:15pm – 4:15pm). After the great success of CppCon 2014, CppCon 2015 has already been announced. It will be held September 20-25 2015 in Bellevue, Washington, USA. CppCon 2014 was a great success. There were over 100 sessions spanning 5 fully packed days. All sessions were professionally recorded and will be available online in a month or so. However, the slides and other material such as source code is already becoming available for download. Not everything is there yet. In the coming days, more material will become available as soon as the organizers receive the documents from the different speakers. 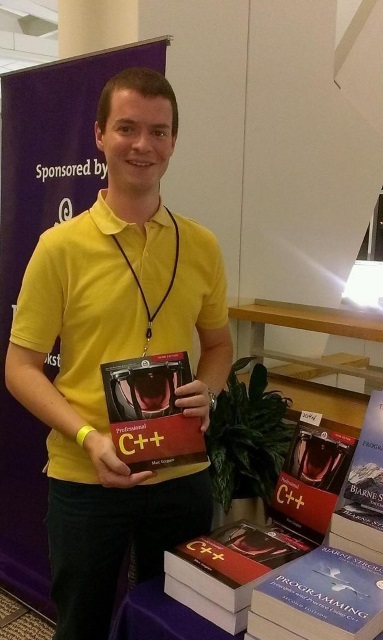 Two pictures of me at CppCon 2014. 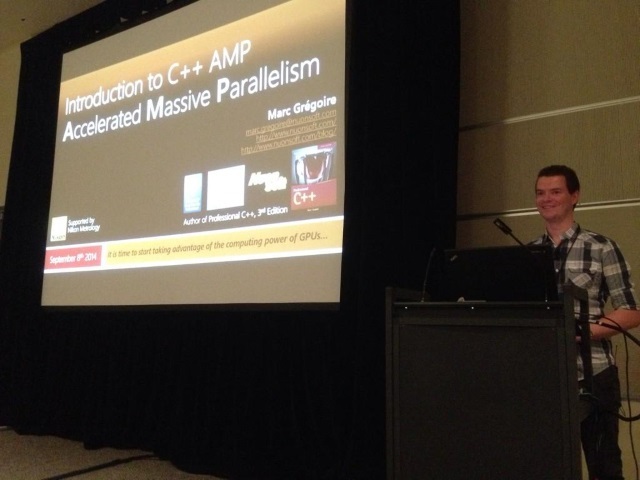 On Monday September 8th, 2014 I gave a presentation titled “Introduction to Microsoft C++ AMP” at CppCon 2014. This was the first edition of CppCon and it was a great success. CppCon is the annual, week-long face-to-face gathering for the entire C++ community. The conference is organized by the C++ community for the community. Taking place this year in the beautiful Seattle neighborhood and including multiple diverse tracks, the conference will appeal to anyone from C++ novices to experts. Invited talks and panels: the CppCon keynote by Bjarne Stroustrup will start off a week full of insight from some of the world’s leading experts in C++. Still have questions? Ask them at one of CppCon’s panels featuring those at the cutting edge of the language. Evening events and “unconference” time: Relax, socialize, or start an impromptu coding session. 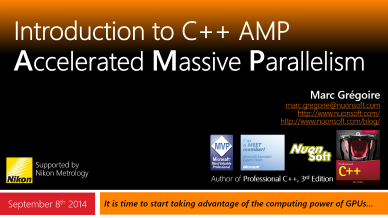 I’ll be giving a presentation myself at CppCon 2014: Introduction to C++ AMP (GPGPU Computing). If you use C++, you should seriously consider coming to the conference.